If binge-watching your favorite show on TV is getting in the way of doing some real exercise, you can try ‘Couchersizing’. This type of workout requires minimal break from the TV (except only during commercial breaks) and exercises that can mostly be done on or in the vicinity of your partner in crime- ‘the couch’. The perfect excuse to get off the couch every once in a while, this exercise requires you to go from sitting to standing to sitting again. Do this 10 times in a row, rest for a minute, and repeat. This move works the quadriceps present in the front of the thighs and the gluteal muscles present in the buttocks. It also improves agility, letting you get up from the chair, the car seat, or the bathroom seat with ease. 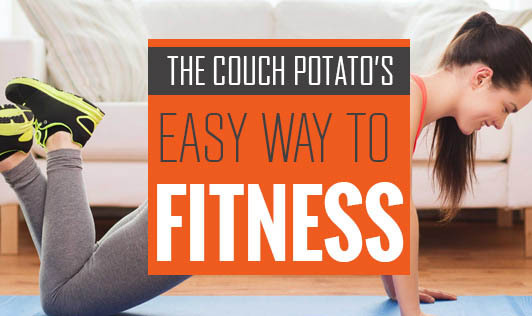 Move to the edge of the couch and rest your feet flat on the floor. Place the heel of one leg on the floor and lift off a little with your toes pointed towards the ceiling. You should feel a slight stretch in your calf muscle. Hold your leg in this position for 30 seconds and then rest it on the floor. Now repeat the same, then do the same with the other leg. Repeat three times per leg. Keeping your calves optimally flexible can keep your walking stride longer, reduce your risk of tripping over your toes, and reduce your risk for common foot injuries. Holding on to the back of a chair for stability, lift one heel toward your buttocks. Hold for 30 to 45 seconds, three times per leg. To improve your balance on unsteady surfaces, try this with your shoes off on a balled-up beach towel. Balance gets better if you practice it, which can decrease the risk of falling. Pinch your shoulder blades together, but not up (don't shrug). Hold for 10 seconds, then repeat 10 times. This move helps prevent a rounded shoulders- forward posture that can develop from many years of sitting, especially in front of a computer. Sit upright and grab hold of a ball, about the size of a basketball. Hold it over your lap and squeeze the ball like you are trying to deflate it. Hold this for a few seconds and then let go. Repeat this 10 times and do another set of 10 repetitions. You can try the same with a smaller rubber ball too. This move helps improve grip strength. So what are you waiting for? Get moving.